By Clare B. Dunkle. New York: Henry Holt, 2003. Book One of The Hollow Kingdom Trilogy. She had never screamed before, not even when she overturned the rowboat and almost drowned. But now she screamed, long and loud, with all her breath. "Oh, I know what's bothering you," Marak teased before Kate could turn away in disgust. "The cloak and hood. It's been on your nerves all evening. You've been imagining all sorts of horrors, I'd guess." This is just another way to goad me, Kate thought grimly, but he was absolutely right. Marak tugged back his hood and examined her stunned expression. He watched her cheeks grow pale, her lips bloodless. He grinned in delighted amusement. "You imagined all sorts of horrors. But maybe not this one." Hallow Hill has a strange and tragic history. For thousands of years, young women have been vanishing from the estate, never to be seen again. Now Kate and Emily have come to live at Hallow Hill. Brought up in a civilized age, they have no idea of the land's dreadful heritage. Until, that is, Marak decides to tell them himself. Intelligent, pleasant, and completely pitiless, Marak is a powerful magician who claims to be a King—and he has very specific plans for the two new girls who have trespassed into his kingdom. Buy THE HOLLOW KINGDOM in paperback. 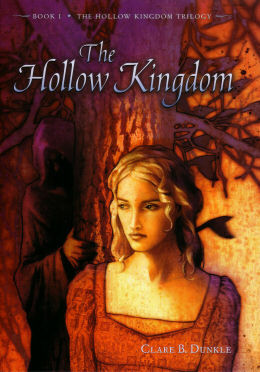 Buy THE HOLLOW KINGDOM in Kindle edition. WINNER of the 2004 Mythopoeic Fantasy Award for Children's Literature. "... First novelist Dunkle turns out a luminously polished fantasy that starts off strong and just gets better. ... A keen romantic tension builds between Marak and Kate, who move, credibly and engrossingly, from the roles of predator and prey to inhabiting positions of peers. ... A masterly debut, it will almost certainly leave audiences hoping for more." An ALA 2005 Best Book for Young Adults. "Calling to mind aspects of Persephone as well as Beauty and the Beast, Dunkle develops her characters in such a way that readers sympathize not only with the sisters but also with the Goblin King and his subjects. ... Once fantasy fans begin this story, they will be unable to put it down." Jacket art for second and subsequent printings, copyright 2004 by Matt Manley. Jacket design by Amy Manzo Toth. Book excerpt may or may not appear on printed book jackets. Excerpt copyright 2003 by Clare B. Dunkle. Text and image courtesy of Henry Holt & Co.